Whoever coined the aphorism “too many cooks spoil the broth” would have had to eat his words if he had ever had the pleasure of meeting Chefs Roberto Bernadoni and Patrizia Branchi. Well-matched in talent, creativity, and experience, the charismatic culinary duo share their epicurean labors of love with eager diners at their Tuscan-inspired restaurant Operacaffe. Their philosophy is fervently egalitarian. Each chef works separately in his and her own kitchen and focuses on a different portion of the menu: Chef Branchi creates entrees and appetizers for the main menu while Chef Bernadoni concentrates on Operacaffe’s sweet desserts. In doing so, Chefs Bernadoni and Branchi have created a culinary repertoire for Operacaffe that is as unified and fluid as their cooperative work practice, with diverse dishes fused together by Bernadoni and Branchi’s collective emphasis on fresh ingredients and traditional Florentine flavors. Both chefs began their love affairs with cooking in their grandmothers’ kitchens. Chef Bernadoni learned to value simplicity and versatility from his grandmother: “[She] could make four separate dishes out of a single chicken…That required a great deal of experience, resourcefulness, and technique.” Chef Branchi learned primarily by watching her grandmother work, piecing together her culinary repertoire by “remembering the flavors” of her grandmother’s recipes and, by feeling it “in the blood.” Both of their foundational culinary experiences in Florence instilled in them a strong appreciation for fresh, seasonal ingredients. Chef Branchi cites herbs like thyme, rosemary, and arugula as her favorite cooking elements, all of which make frequent appearances in her richly aromatic concoctions. Both chefs handle the culinary styles of their grandmothers with a strong reverence for tradition, while infusing each dish with their own creativity. Dishes like the Perra Pazza salad or Patrizia salad may incorporate familiar Italian ingredients like gorgonzola and Parmesan-Reggiano, but Chef Branchi applies her own unique twist to each, presenting the Perra Pazza as a whole pear in a dazzling trompe l’oeil, or adding avocado to the traditional ingredients in her namesake salad. In this way, the cuisines of both chefs exhibited at Operacaffe are an amalgamation of a shared cultural past, and their own distinctive personalities and culinary visions: while each dish is crafted with the utmost artistry, a strong sense of familial comfort reflective of their grandmothers’ teachings still shines through. 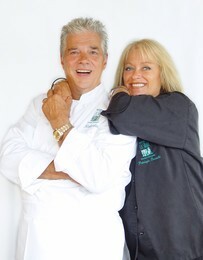 Both Chefs Bernadoni and Branchi similarly began their culinary careers later in life after pursuing other avenues. Bernadoni worked as a civil servant for the city of Florence until age 31, when he left his job and opened up his first restaurant, Ganino. Branchi worked as a model, pursuing her own love of cooking by hosting dinner parties and entertaining friends. After meeting Bernadoni at Ganino, and later marrying him, Bernadoni encouraged her to open her own restaurant. Her restaurant became just as popular as his own, with both restaurants populated by the likes of Gianni Versace, Giorgio Armani, a variety of soccer super stars, and, most notably for Chef Bernadoni, the illustrious Chef Paul Bocuse. The skills of both Bernadoni and Branchi were well-noted in Italy, culminating in Chef Bernadoni being honored alongside esteemed Chef Alain Ducasse with the Catarina di Medici culinary award. They have since exported their gastronomic success to California, charming San Diego diners with their palate pleasing creations and their warm hearts since 1991. It is the heart,” that for Chef Bernadoni is “the first ingredient. You can’t do it for the money; you have to do it for the passion.” In this way, the flavors of a meal at Operacaffe are inextricably linked with the welcoming personalities of the two chefs. Like their food, their personalities complement each other: Chef Branchi’s calm is the perfect foil for Chef Bernadoni’s animated antics. While Chef Bernadoni entertains with his comedic patter, Chef Branchi acts as an adept straight woman, providing fuel for her husband’s routine with a knowing smile. Throughout my visit, they exchanged playful quips and teasing barbs in a comedic pas de deux worthy of Myrna Loy and William Powell in “The Thin Man.” For Chef Branchi in particular, the very act of cooking is an improvisational act, in which she feels free to “create whatever [she] feel[s] inspired by.” This skillful spontaneity makes its way into every aspect of the restaurant: the eclectic décor, the witty repartee, and the dazzling dishes on the Operacaffe menu all reflect an inventive and affectionate whimsy that, like any good performance, is carefully constructed and thought-out despite its seeming effortlessness. And like any great performance, as a diner, you get swept away, sharing in the chefs’ deep passion for the food, and the inviting family feeling they have created.